My grandfather was an avid gardener and the house I grew up in the Philippines was surrounded by an orchard of fruits and vegetables, flanked by different kinds of flowers, plants and trees. A favorite one when I was growing up was a flimsy flower tree by the foot of the stairs that led to our house — it was tall, but light enough for me to shake gently so that my sisters and I can pretend that it was raining (the dew drops filled in). On sunny afternoons, I would give the tree a gentle shake, its flowers falling slowly from its branches and the three of us would sit in wonder, in awe of the falling pink petals. I was thinking about that tree, and these things in my childhood as I read Michael Pollan’s The Botany of Desire (Amazon | Indiebound). The book has brought up a lot of different emotions and memories for me on nature, on food, on my complex history with these things; it even prompted a post on my personal history with food earlier this week. The Botany of Desire is a book about the plant’s eye-view of the world — specifically the apple, the tulip, marijuana and the potato — and how each of these things have been shaped by human desires. What seems to be at first a process of domestication, Pollan explores how humans can actually be objects of these plants’ desires for survival. A is for apple. A is for America(n). How many times have you ever heard of the phrase “as American as apple pie”? The apple has been an essential part of American lexicon — wholesome, healthy and sweet. These attributes, specially sweetness, has elevated the symbol of the fruit, actually a native of Kazakhstan to a symbol that most of us identify with. I gifted Michael Pollan’s Food Rules (Amazon | Indiebound) to all my aunts and uncles one Christmas, along with a plant. The slim volume just came out a few months before that and I thought of it as the best manifesto for eating, the perfect holiday present. Since reading In Defense of Food (Amazon | Indiebound), I’ve become a huge Michael Pollan fan. I loved how he dissected the most mundane things like grocery shopping, and turned them into such internally provocative gestures which revealed a lot more about ourselves and the world we live in that we initially thought of. (I’m not sure how well the books were received though — we are a family of carnivorous folks with a penchant for rich and salty food). This time around, I’m back to another one of Pollan’s book: The Botany of Desire (Amazon | Indiebound). I’ll save all the details of the book for the review later this week but reading it touched on something I’ve been thinking about for a while now. As I get older (and as what older folks used to tell me), my body is not just as receptive as it was before to food. Sure, I’ve gained a few pounds and it’s been a lot harder to shed most of it than when I was 25 (I have a really high metabolism which is a curse and a blessing at the same time, if you ask me). I’ve also never been into sweets before (even as a young kid) but these days, a week can’t go by without a cup of milk tea with tapioca. I tend to bobafy myself pretty consistently, just check my Instagram story. I know which food is good for me, and I know which food will make me feel like crap. After a recent trip to the Philippines, I was jet lagged and depressed for days. After waking up at 2 on a Thursday morning feeling like I need to pack my bags and move back to the homeland, I decided to make myself some food. I fried some SPAM and eggs, ate it with rice and crawled back to bed, feeling a lot more at peace. I slept like a baby. My own trips to the grocery store (Trader Joe’s to be exact) got me coming home with a bag full of the following things: eggs, chicken sausages, spinach, kale or arugula, ground turkey or chicken, chile dried mangoes and a bag of nacho cheese chips. By the end of the week, only the eggs, chicken sausages and the bag of chips would be fully consumed. There are weeks where I end up wasting so much food that it deters me from even going to the grocery store to begin with. Saturday brunch at Berkeley Social Club, featuring the tastiest and crunchiest Yukon potatoes ever. So what do I eat? I tend to go to the cafe at my workplace which is relatively healthy and cheap (with some extremely processed options) or order food for delivery which has become quite an expensive habit. I also love to eat out, another drain in my bank account. At home, the rice cooker is usually brimming with cooked, white rice. The cupboard is stocked with many, many cans of processed food and bags of chicharron (fried pork rinds). Living with my family has been incredibly nourishing but alas, also fattening. It’s quite apparent: I have a hard-to-break predilection towards processed food. SPAM, hotdogs, sausages, corned beef. I want them all, any time, any day. All of these things tell me one thing: that food is largely emotional for me. It was only in the past few weeks that I realized I was just mimicking what I grew up with back in the Philippines: an abundance of salty, processed food (we lived about an hour away from a U.S. military base) and the instantaneous presentation of meals (I grew up with Ate Marie, our nanny and cook). All of it finally made sense. Reading The Botany of Desire (Amazon | Indiebound) then was something special because instead of just analyzing man’s relationship with food, Pollan went deeper into man and society’s relationship with plants instead, correlated to our different desires. This perspective just turned my head around, because it gave me an appreciation of how plants can also possibly view the world around them. Affirming the life inherent in each morsel I bite does something to me, turning what I thought I already knew into an expanded version of reality, rife with biodiversity. As I challenge my salty and processed food-seeking tastebuds, I’ll be keeping Pollan in mind, along with the philosophy, history and politics of food, of plants. I can’t believe it’s the second half of the year already. Where did the first half go?! I hope you’ve been enjoying the long weekend with family and friends, or if you’ve been doing it the way I have — with your current reads. My excitement for this month’s reading list cannot be contained, so much so that I’m on the second book already because I was that eager to get to actually reading. I’m a little behind too on my goal for this year (54 books) so I figured I could use the downtime to catch up. The past two weeks have been really heavy on the political side, as I finished reading Lualhati Bautista’s Desaparesidos (book review out this week) and Oscar Lopez Rivera’s Between Torture and Resistance. I’m still thinking about those narratives, of the lives of people like those in Bautista’s novel and OLR’s sacrifice for a cause bigger than himself. It’s easy to get lost in our routines, to see each day and each week like the others past, and then find yourself one day asking where time has gone (I mean, I just started this post with that sentiment). Between juggling a full-time job, organizing with a grassroots women’s group in the Bay Area and reading and blogging for Libromance, some days feel like a blur. I need constant reminders to slow down, to make my days wider and freer, to be more spontaneous. I have yet to find that balance, but these past few days have been healing. Between all the things I do, keeping up with my books & looks on the daily and carving out moments for loved ones, I have to remind myself to breathe. To take it all in, with grace and even more joy. That in spite of what’s happening around me, in spite of internal turmoils I may face, there’s alwasy a spark of joy that can be ignited. This month’s first book is Frida Kahlo: I Paint My Reality which I finished in a day (yesterday). I still have a hangover from my trip to Mexico City, specially Coyoacan, where Frida grew up and spent most of her time. I have yet to write about my trip for the blog but it’s definitely in the works! Right after, I started Arundhati Roy’s The Ministry of Utmost Happiness. The only reason why I didn’t start reading Roy’s latest novel is that it still hasn’t arrived and the moment it did, I was ready. After being blown away by The God of Small Things, I tried to greet Roy’s other books with the same vigor. But it wasn’t the same. As I write this, I’ve read about 50 pages of the new novel and so far, it has been worth the wait. Other titles that I’ll be delving into this month include Michael Pollan’s The Botany of Desire. I’m a fan of the Berkeley native, ever since he came out with books like Food Rules and In Defense of Food. He made me realize how complicated our food has become, and that a return to simplicity (to what our grandmothers actually recognize as food) is warranted. A friend recommended Magda Szabo’s The Door awhile ago so I thought it’s high time I read it. I really don’t know much about the book but hey, it has a 4.06 rating on Goodreads. And last but definitely not the least is F. Sionil Jose’s Gagamba. The title is the Filipino word for spider, and it’s a little embarrassing that I still haven’t read any of his work. This will be my first book from the author, a title I picked up when I was in the Philippines in March. What are you reading this month? Let me know by leaving a comment below. As always, happy reading! I’ve long been a fan of writer and philosopher Alain de Botton who founded The School of Life (TSOL), which is devoted to creating emotional intelligence with the help of culture. 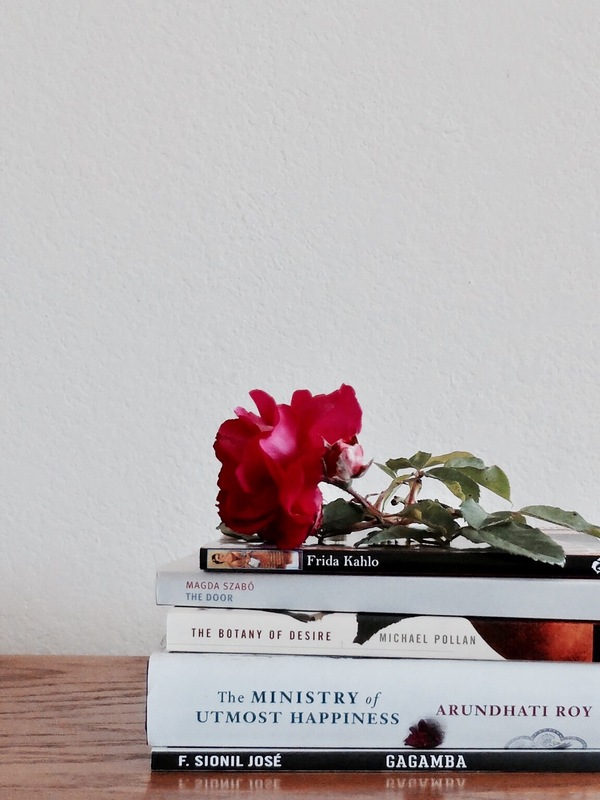 One of the many services of TSOL is called Bibliotherapy, a therapy session that “helps you explore your relationship with books and guide you to anew literary direction.” I gushed at this idea because, well, this whole blog is dedicated to literature. Ceridven Dovey wrote about her experience with TSOL’s Bibliotherapy, calling the session a “gift” after corresponding with Bibliotherapist Ella Barthoud. We had some satisfying back-and-forths over e-mail, with Berthoud digging deeper, asking about my family’s history and my fear of grief, and when she sent the final reading prescription it was filled with gems, none of which I’d previously read. It’s not the first time that I’ve read about this idea — I had, once, a delightful and enchanting experience reading Nina George’s The Little Paris Bookshop. I wrote about it here too, and it was such a joy to meet Monsiuer Perdu, the bookshop’s owner. It turns out that this is not a new practice, as Dovey references A Literary Clinic that first appeared in The Atlantic Monthly back in 1914. She points out that today, bibliotherapy comes in different forms such as literature courses and reading circles. The demand for literature, it seems, is growing even as we move towards an age of instantaneous information. There’s Oprah’s Book Club, and there’s also classes like The Craft of Reading at the UC Berkeley Extension. In the Spring of 2015, I enrolled in the online class where I was introduced to the work of Alice Munro, Marguerite Duras and Iris Chang. Engaging in discussions with other readers in class was exhilarating — demystifying Duras’s The Lover was a thrill, and so was crossing Munro’s verbal landscapes. I’ve also engaged in mini-bibliotherapy sessions myself: recommending Miguel Ruiz’s The Four Agreements to a friend and my sisters; how I’ve given bell hooks’s All About Love to previous lovers at the beginning our soon-to-fail relationships (since 2012, a period of turmoil); gifting Michael Pollan’s Food Rules one Christmas to my mother’s siblings (all nine of them); giving a copy of John Perkins’s Confessions of an Economic Hit Man to my father, so he could see the scope of American imperialism from a different lens; and countless other times. Below are a few of my musts, books that I’ve gone back to several times, titles that I’ve shared with loved ones and strangers. They are timeless, generous and full of illumination. From my bookshelf to yours, here’s my version of literary prescription.